Handed down from generation to generation since 1835, this family-run company with more than 180 years of know-how based in Nancy and run by Alban and Thierry Utard developed an undeniable high work quality. Their expansion has been supported by its new equipment’s advanced technology and by a constant research to find new innovative products. 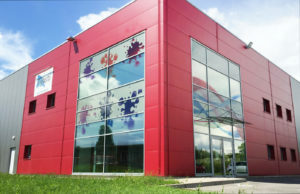 Due to the development of the company, Righetti moved to Fléville in 2011 in a new 3000 m² production facility, which was the first industrial low-energy building in the East of France at the time. In fact, Righetti almost doubled its volume in terms of workforce and productivity, which makes this company a key player in the glass industry. Righetti produces a range of quality laminated glass products, for several applications like in buildings, homes, decoration and other uses. We offer a range of functional, design and building-related benefits including safety, solar and sound control solutions, as well as UV protection, decorative uses and energy efficiency benefits. Our laminated glass is branded Righetti and it is made by a process that consists in assembling two (or more) glass sheets. They are joined together by a tough interlayer, called EVASAFE Bridgestone Ethylene made out of Vinyl Acetate (EVA). The outcome is a high-performance glazing that can withstand hard blows from violent impacts. If the window breaks, the fragments will stick to the interlayer and therefore maintain the integrity of the window. Whatever the complexity, Righetti uses EVASAFE interlayers in their laminated glass because it is a quality film which is tested, certified and in compliance with legally required European Union standards. The evasafe laminated glass is similar to the glass used in car windscreens. The evasafe interlayer is clear and therefore invisible when viewed through the glass. However, interlayers can be tinted to produce colours for architectural or decorative applications. The thickness of the Evasafe interlayer and the number of glass sheets affects the level of safety of the glass. By increasing the thickness and the number of glass sheets, advanced levels of safety can be achieved. If you need more information, feel free to contact us.